Hi , I did download the wallet but cant get it to sync, sent few coins in to get it going but nothing . Well does it works with UFOcoin? I’m sorry, but you are on the Feathercoin forum. We don’t develop or support the Ufo Wallet. @xonar can you help maybe? Hi there, now the issue is fixed. The wallet work well but it’s stop syncing when the ufocoin network have low mining activity. Anyway connections to nodes are always done. When a Wallet tries to connect to the network first time, it needs to get the addresses of one or more peers to download the blockchain. To get these peers, it connects to a special node, called seeder, which tracks all active nodes and provides the ip addresses to new nodes. The address of the seeder(s) is hardcoded in the client code. The behavior you describe is a typical symptom, that no seeder is reachable. You solved the problem the right way, by adding a node to your client with the addnode command. You node now maintains a list on known nodes, so that the problem should not occur again. If it occurs again, you need to contact the UFO developers and inform them, that their seed node is down. p/s - ‘it’ can do d ‘aviation’ thing at more ‘higher-ups’, is it…? 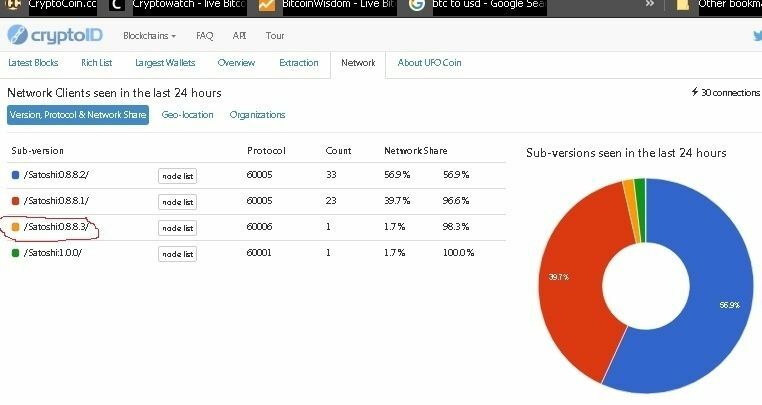 @xonar Something wrong with UFO wallet/masternodes/whatever today? Sync is stuck on block 1080513 from this morning. Mining sites all having problems too. Any big changes happen that I didn’t read about? Nevermind. Seems to be fixed now.